Reading is a good habit and is indeed a great source to gain knowledge. It helps build vocabulary, increase attention span, change perception and much more. But to carry a book at all times can be cumbersome. Which is why Amazon’s iconic eBook reader is a mighty success since its launch. Kindle makes reading easy and fun. It has a collection of more than 5 million books, magazines, and newspapers. Most of us are aware of the simple process of getting books on Kindle but often wonder if there is an option to share them with our loved ones. The answer is a Yes! All you need to do is to follow these few simple steps and start sharing books. 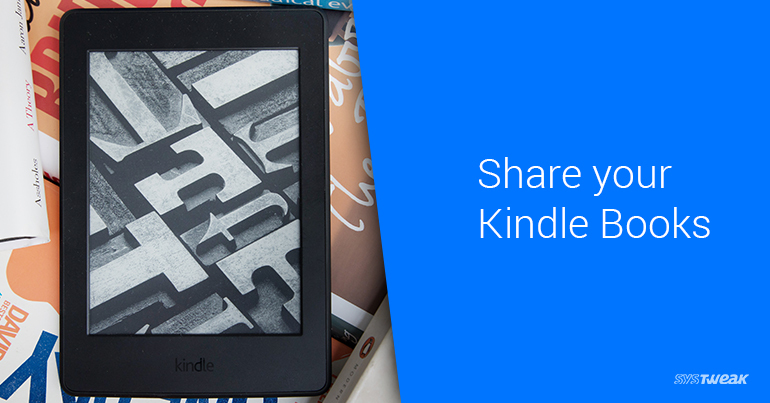 How to share your Kindle book? Do you have a group of friends or family members who are avid readers? If yes, then what are you waiting for? You can share them with up to two adults and four children. This doesn’t mean that once you lend your book, you lose access to it. You can also read the same book without any interruption. The book can be shared with one another irrespective of the Kindle reader they’re using. Before you start handing out your Kindle books to your family members, you need to give them access to your Library. Login to your Amazon account and go to, Manage Your Content and Devices section. Now head to Household and Family Library section under Settings tab. Tap on, Invite an Adult/Invite a Child button. The adult/child with whom you wish to share the book with, must have an Amazon account. Enter the Amazon email and password. You need to share payment methods between both the accounts, by tapping yes. Choose the book you’d want to share. When all is done, you’re now ready to start sharing your Kindle books. Login to the Amazon account then go to Manage Your Content and Devices section. Under Content tab, select Show Family Library link. Choose the book(s) you’d like to share and Tap Add to Library. Now select the contact and Tap OK.
Login to your Amazon account, go to Manage Your Content and Devices section. Select the books you’d like to send and tap Deliver. Now, choose the location from the pop-up menu where you want the borrowed books to be sent and again Tap Deliver. Isn’t it easy to share Kindle book with other readers like you? However, sharing books with someone will be accompanied by a set of rules. You can transfer Kindle book for up to 14 days only. It can be transferred only once and cannot be shared again since it is locked with the library. A Fire tablet or Kindle e-book reader is not required to open a loaned book, but you will need to have a Kindle app. You cannot lend all Kindle books as some publishers have imposed restrictions on book lending. If there is no option to loan then it can’t be shared. It is the easiest way to share a Kindle book via the products page. Go to the online Kindle Store and type name of the book you’d like to loan. Now, select the book you wish to loan. Next, Tap Loan this book on the product page and in the new page, enter recipient’s email address. Tap Send now to share the book. Want to escape from the trouble of heading to an online Kindle store to share book use Kindle library itself. Open your Amazon account login to it and then go to the Manage Your Content and Devices page. Next, tap the Actions button, that you will get when you tap on the magazine title you wish to loan. Then select Loan this title. You want to buy a book but are short of funds and don’t even have a library card, you can ask your friend. When you get a book on loan, you receive an email notification that allows you to download it to your Kindle or Kindle app. Tap the Get your loaned book now button. Select the device where you want the book to be delivered to, and then Tap Accept loaned book. In case you don’t have a Kindle or the app, tap Accept loaned book and follow the on-screen instructions to download the Kindle app. If you are thinking how to return the book before the 14-day lending period is up. Log into your Amazon visit Manage Your Content and Devices page. Tap the Actions button next to the borrowed book, and select Delete from the resulting list of options. Tap Yes to confirm your return. This way you can easily return the book. Hope you enjoyed borrowing a book from your family and friend easily. Isn’t it a great way to read more and more books and share what you find best. We hope you will give it a try. Let’s not keep all the book to ourselves, it’s time to share them.